It's time to take a look at the Top 100 interactive visualizations from the first three months of 2013, and I'd like to take a moment to share a few observations about the list and what it reveals about Tableau Public and data journalism worldwide. This past quarter illustrates the global nature of Tableau Public adoption. Starting at the top of the list and working downward, you will see workbooks published from Argentina, the Netherlands, Italy, Australia, Canada, China and the UK. In all, 17 countries are represented in the top 100 visualizations this quarter. That's pretty remarkable. Having recently joined Tableau, I was surprised and impressed by this widespread adoption. It demonstrates that data driven journalism is a worldwide phenomenon. The reason no country has more visualizations in the top 100 than Argentina (the US and Argentina both can claim 26) is La Nacion, which is behind 25 of the top 100. 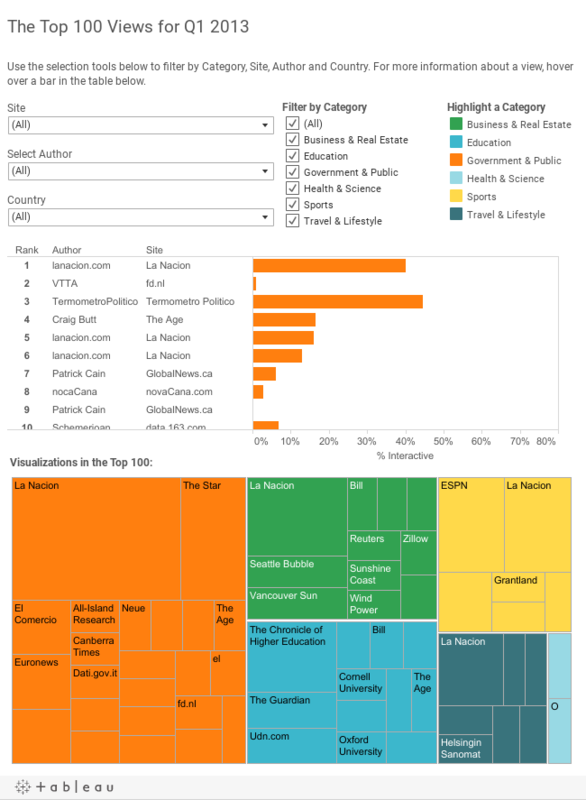 And it's not just that La Nacion has many in the top 100; their visualizations are at the very top of the list. In fact, a full half of the top 6 visualizations were created by La Nacion. My hat goes off to this group from Buenos Aires. They're doing amazing things with data. While 9 of the top 10 belong in the category "Government & Public", you can see from the treemap at the bottom that a wide variety of topics are addressed overall. Tableau Public authors have visualized everything from sports to real estate to education to health, demonstrating that data is a useful way to augment many different types of stories. Who will be at the top of the list in Q2? We'll soon see.